On 11 April 2019, the Chair wrote to the Permanent Secretary, HM Treasury, to request that the Treasury removes the PRP from the MOJ’s accounting system for this financial year moving forward. On 11 March 2019, the Chair received a letter from Margot James MP, Minister for Digital and the Creative Industries, following the publication of the PRP’s latest annual report on the recognition system on 12 February 2019. On 20 December 2018, the Chair wrote to the Permanent Secretary, HM Treasury, to inform them that the PRP is independent of the Goverment, government departments and indeed any other body. As such, the PRP should not be included in any ‘departmental boundary”. On 14 January 2019, Ian C Lucas MP (Labour, Wrexham), asked the Secretary of State for Justice, why the Press Recognition Panel was added to his Ministerial responsibilities; and what assessment he has made of the effect of that decision on the work of the Panel. “The Royal Charter establishing the Press Recognition Panel sets out the responsibilities of the Lord Chancellor. Other than in his role as Lord Chancellor, the Secretary of State for Justice does not have any ministerial responsibilities in respect of the Panel. On 19 November 2018, the Chief Executive of the Civil Service Commission wrote to the Chief Executive of the PRP about succession planning for the PRP’s Board Members. The Chief Executive of the PRP responded on 6 December 2018. On 19 November 2018, the Chair wrote to Facebook, inviting them to meet to clarify information about our role. On 20 July 2018, the Chair wrote to Jeremy Wright MP, the new Secretary of State for Digital, Culture, Media and Sport, to introduce him to the PRP. 9 May 2018, information was provided to Sir Vince Cable MP, Lord Lipsey, Lord McNally, Tom Watson MP and Bill Wiggin MP following requests for the PRP to provide an indication of how far IPSO may or may not be compliant with the Royal Charter criteria. Applying to be assessed by the PRP is voluntary and the complaints body has chosen not to apply. A lot of the information needed to assess key matters does not appear to be in the public domain, however, the Executive produced a document that comments on some of the issues that is was able to find information on. On 4 May 2018, Tom Watson MP wrote to the Chair regarding the Data Protection Bill and issues related to the work of the PRP. The Chair replied to Mr Watson on the same day. 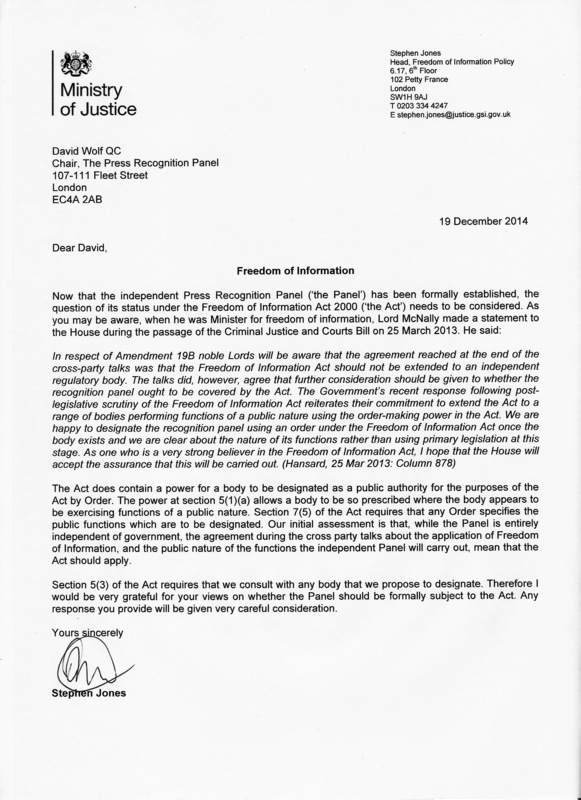 On 3 April 2018, the Chair wrote to Prime Minster Theresa May to request a meeting to discuss the system of press regulation that was put in place following the Leveson Inquiry. In his letter, the Chair explained that the PRP was particularly keen to discuss matters with the Prime Minister now, given the widespread misunderstanding and misinformation about the recognition system contemplated by the Charter and Crime and Courts Act 2013 and about how the sector has changed since then. On 3 April 2018, the Chair also wrote to Matt Hancock, Secretary of State for Digital, Culture, Media and Sport; Tom Watson, Shadow Secretary of State for Digital, Culture, Media and Sport; Crispin Blunt MP; and Sir Oliver Letwin MP to request a meeting. On 14 March 2018, the PRP submitted evidence to the House of Commons Public Bill Committee on the Data Protection Bill. On 8 February 2018, having noted the increase in parliamentary and media discourse about the regulation of social media companies and their possible legal status as news publishers, David Wolfe, Chair of the PRP wrote to Facebook, Google and Twitter. On 8 February 2018, as part of the PRP’s ongoing commitment to ensuring that the PRP’s work and role are understood by everyone, David Wolfe, Chair of the PRP wrote to MPs who had engaged with the PRP previously to provide an update on our work. He also wrote to MPs who we noted had an interest in press regulation and are as related to the PRP’s work. The letters have been published online. Following the publication of the PRP’s 2017 report on the recognition system, the Chair of the PRP received a letter of acknowledgement dated 16 January 2018 from the office of the Lord Chief Justice. On 10 January 2018, David Wolfe, Chair of the PRP, wrote to Lord Ashton on Hyde regarding the Data Protection Bill. Matt Hancock was appointed Secretary of State for Digital, Culture, Media and Sport on 8 January 2018. David Wolfe, Chair of the PRP, wrote to Mr Hancock to introduce the PRP. On 8 December 2017, the PRP wrote to all members of the House of Lords to provide an updated note on press regulation, the work of the Press Recognition Panel (PRP), and the Data Protection Bill, which was due to be debated at report stage in the House of Lords in the coming days. The note addressed questions that arose following the PRP’s note to peers on 27 October 2017. On 6 November 2017, David Wolfe, Chair of the PRP, wrote to Karen Bradley, Secretary of State for Digital, Culture, Media and Sport. This followed the Secretary of State’s appearance in front of the Digital, Culture, Media and Sport Committee on 11 October 2017, and was in accordance with the PRP’s policy of contacting stakeholders who comment on the Charter and its operation, with the aim of ensuring full and proper public understanding of those things. On 6 November 2017, David Wolfe, Chair of the PRP, wrote to Lord Skidelsky, Lord Stevenson, Lord Clement-Jones and Lord McNally regarding the Data Protection Bill, which was progressing through the House of Lords, and the recognition system, having noted their interest in the Bill and the role of the recognition system. On 12 November 2017, David Wolfe, Chair of the PRP, wrote to Lord Kennedy regarding the Data Protection Bill, which was progressing through the House of Lords, and the recognition system, having noted their interest in the Bill and the role of the recognition system. On 6 November 2017, David Wolfe, Chair of the PRP, wrote to the NMA, following correspondence that raised concerns about IMPRESS. On 6 November 2017, David Wolfe, Chair of the PRP, wrote to the PPA, following correspondence that raised concerns about IMPRESS. On 27 October 2017, the PRP wrote to all members of the House of Lords regarding the draft Data Protection Bill that was about to enter its Committee Stage. The note explained that it was the PRP’s contention that ‘Any standards code adopted by an approved regulator, as defined by the Crime and Courts Act 2013’ should be added to the list of exemptions to the protection of personal data for special purposes that include journalism, within the draft Bill. On 29 September 2017, IPSO shared with the PRP a copy of a letter that it had sent to IMPRESS. Susie Uppal, CEO of the PRP, responded to IPSO to confirm that the PRP had received the letter. The PRP received an email from the PPA on 28 September 2017 to which Susie Uppal, CEO of the PRP, responded on 29 September 2017. The PRP received an email from the NMA on 27 September 2017 to which Susie Uppal, CEO of the PRP, responded to on 29 September 2017. The PRP received a letter from the NMA on 2 October 2017 to which Susie Uppal, CEO of the PRP, responded to on 6 October 2017. The PRP received a further email from the NMA on 9 October 2017 to which Susie Uppal, CEO of the PRP, responded on the same day. The PRP received a letter from the Society of Editors on 5 October 2017 to which Susie Uppal, CEO of the PRP, responded on 16 October 2017. 23 May 2017 we received a letter from the solicitors for the NMA suggesting that the final hearing be adjourned given the pledge in the Conservative party manifesto to repeal section 40. 26 May 2017 we responded to the NMA’s solicitors. We have not agreed to their request but have suggested that the NMA withdraw their claim. On 16 February 2017, Susie Uppal, CEO of the PRP, wrote to Stig Abell, Editor of the Times Literary Supplement, to request a meeting. We received an acknowledgment, but we have yet to receive a formal response. On 14 February 2017, Susie Uppal, CEO of the PRP, wrote to Tony Gallagher, Editor-in-Chief of The Sun, to ask him to clarify statements that he made during a recent radio interview. We received an acknowledgment, but we have yet to receive a formal response. On 21 December 2016, the PRP wrote to RPC, the law firm representing the News Media Association, in reply to their judicial review letter before claim. Letter dated 20 December 2016 from Bindmans, the law firm representing IMPRESS, to the PRP, related to the proposed judicial review of PRP Board’s decision to recognise IMPRESS. Letter in response from PRP CEO Susie Uppal, sent 20 December 2016. Pre-action protocol letter dated 5 December 2016 from RPC, law firm representing the News Media Association, to David Wolfe, regarding the PRP Board’s decision to recognise IMPRESS on 25 October 2016. Letter in response from PRP CEO Susie Uppal, sent 9 December 2016. RPC sent a letter in response on 12 December 2016. Letter dated 11 November 2016 from Matt Tee, CEO of IPSO, to Susie Uppal, CEO of the PRP, explaining conclusions that he had drawn about the PRP’s longer term funding. Letter dated 15 November 2016 from Susie Uppal to Matt Tee explaining that the PRP had not yet made any decision about future funding nor had it had any discussions about this with government, or any other party. Letter dated 1 Novemeber 2016 from Karen Bradley MP to PRP Chair, David Wolfe, regarding the Government’s consultation on the Section 40 of the Crime and Courts Act 2013. Letter in response from the PRP dated 3 November 2016. Email dated 24 August 2016 from Lynne Anderson of the News Media Association, and the PRP’s response dated 26 August 2016. Letter dated 22 August 2016 from John McLellan of the Scottish Newspaper Society and the PRP’s reponse dated 22 August 2016. Letter dated 22 August 2016 from Lynne Anderson of the News Media Association and the PRP’s reponse dated 22 August 2016. Email dated 22 August 2016 from Peter Wright of Associated Newspapers, and the PRP’s reponse dated 22 August 2016. Letter dated 22 August 2016 from Bob Satchwell of the Society of Editors, and the PRP’s response dated 22 August 2016. Letter dated 19 August 2016 from Lynne Anderson of the News Media Association, and the PRP’s response dated 19 August 2016. Letter dated 19 August 2016 from Mike Harris and Sashy Nathan of 89up and the PRP’s responses dated 19 August 2016. Email dated 18 August 2016 from Peter Wright of Associated Newspapers, and the PRP’s response dated 19 August 2016. Letter dated 18 August 2016 from Owen Meredith of the PPA, and the PRP’s response dated 19 August 2016. Letter dated 18 August 2016 from Lynne Anderson of the News Media Association, and the PRP’s response dated 19 August 2016. Letter dated 15 August 2016 from Lynne Anderson of the News Media Association setting out concerns about the PRP Board’s initial indicative views on some terms and elements in the Royal Charter, and the PRP’s response dated 16 August 2016.